Social Media, Actually An Instrument To Take On Lobbyists? The Article: Colorado Rejects Fracking: The Money’s Not Talking; Social Media Is by Richard Levick in Forbes. The Text: Colorado was ground zero in the hydraulic fracturing debate on Tuesday, as four local municipalities voted on moratoriums or outright bans. In Boulder, 76 percent of voters favored extending a moratorium already in place. In Fort Collins, 55 percent supported a freeze on the practice. In Lafayette, 58 percent voted for a charter amendment that will ban fracking permanently. Only in Broomfield, an area that traditionally trends Republican, did voters reject the environmentalist agenda. It’s five-year fracking ban failed by the slimmest of margins (50.51 to 49.49 – or just 194 votes). After grinding the Keystone Pipeline to a halt, it’s clear that activists have zeroed in on their next target – and they are influencing the conversation with stunning effect. Ahead of yesterday’s referendums in Colorado, we had already seen fracking moratoriums and bans established in New York, Pennsylvania, Maryland, Wisconsin, Hawaii, and a numerous other states, municipalities, and countries. If Tuesday’s results are any indication, more are on the way. And that’s despite a major energy industry lobbying advantage that has won some powerful allies; despite industry advertising budgets that dwarf the activist war chest; and despite compelling positive narratives about prices, jobs, and energy independence that should be having a far greater impact than we have seen to date. The problem? Energy companies are fighting the fracking battle with Keystone tactics. In the end, it may net them the same result. This summer, the Keystone Pipeline enjoyed 77 percent public support. That number dropped to less than two-thirds by September. Why? Because activists dominated the narrative online. They transformed social and digital media strategy into a force multiplier that grew their ranks; amplified their messages; mobilized support; and, ultimately, provided policy makers with a false sense of public sentiment. On fracking, we are watching the same movie all over again. Social media outreach, online content development, and Search Engine Optimization (SEO) and Marketing (SEM) are all dominated by activist voices. As a result, they are not only rallying significant grassroots opposition; they are doing it in ways that neutralize any advantage that industry money once provided. The Colorado Oil and Gas Association spent $878,120 on city-specific campaigns to defeat the four proposed moratoriums. Activists spent $26,000 in support of those measures. But while industry money went into advertising and traditional “outreach” campaigns that net diminishing returns in the digital age of public affairs (just as it did in support of Keystone), activists stretched every dollar with online efforts that prove far more effective. They built content-rich microsites that clearly and succinctly laid out the supposed dangers. They utilized Facebook to target their messages, tap into supporters’ networks, and ensure their people got to the polls. They utilized Twitter to push every positive development and promote local screenings of the anti-fracking documentaries Gasland and Gasland II. They even leveraged YouTube to share visuals of fracking’s alleged impacts and infuse their overarching messages with added doses of emotion and fear. They also supported each of those efforts with SEO and SEM campaigns that shot their messages to the top of the Google rankings. In response, Coloradans for Responsible Energy Development (or CRED – an acronym that only a Nixon re-election strategist could love – think CREEP) built a microsite that, up until a few weeks ago, was static, non-social, and unsupported by devoted SEO or SEM campaigns. CRED.org has since undergone an impressive transformation and enhanced its presence across all those fronts. Unfortunately, it seems the makeover was too little and too late to prevent major losses at the polls. All in all, Colorado was the continuation of trends we’ve seeing across the country for some time. Consider the national presence that fracking opponents maintain on social media. Combined, the top ten opposition groups enjoy 2.1 million Facebook likes and 1.2 million Twitter followers. Those figures far outweigh the 28,000 Facebook likes and 70,000 Twitter followers that supporters have attracted to date. Politically, likes may not mean much, but having almost none certainly means far less. The chart below illustrates just one element of the activist advantage. 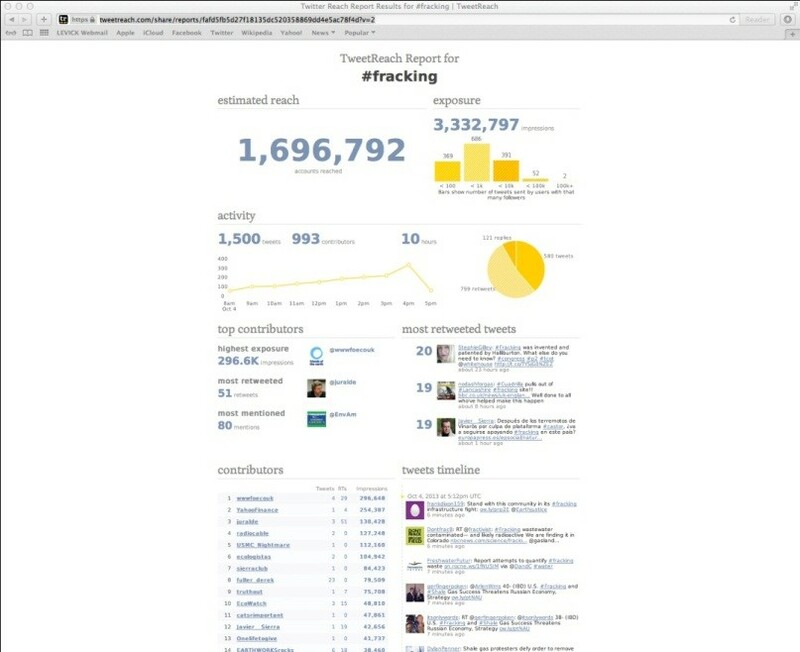 It examines tweets that used the #fracking hash-tag in a an average 24-hour period this fall. There were 1,500 tweets in that period from 993 separate users. Those 993 accounts had 1.7 million combined followers and the tweets themselves generated 3.3 million estimated impressions. The most re-tweeted tweets are listed on the right and clearly demonstrate that the most influential conversation around this topic is highly negative. What’s most interesting is there is no engagement by industry. No communicating with influential neutrals, no two-way conversation. It’s just another one way street dominated by the anti-fracking community. Activists aren’t monolithic or dumb. They are open to conversations and new ways of looking at the world. Talk with them (not at them) and most will listen and some will even re-tweet a different point of view. When it comes to the search engines – the portals by which most Americans (including journalists and policy makers) now access information on public affairs issues – the activist advantage is just as lopsided. A Google search for the term “fracking” returns four activist-controlled sites and not one Web property owned by supporters or the energy industry. Everything else on the search page is negative articles. No optimization, no communications. What all of this demonstrates is that television and newspaper advertising, campaign contributions, and heavy lobbying fees no longer guarantee successful outcomes for the energy – or any other — industry. Those efforts still hold some value; but they are a part, and not the largest part, of a larger tool chest. Not the tool chest. In the age of the digital citizen, energy companies must approach their public affairs agendas with all of the same digital tools they utilize so effectively to promote their brands. Unfortunately, very few, if any, do so. Activists understand that the marketplace of ideas has evolved – and they are evolving – and leading — right along with it. If fracking is to become an accepted practice in the U.S., the energy industry must do so as well.